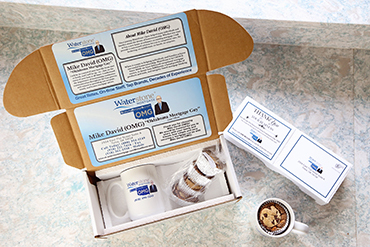 Cookie Advantage is a Customer Care Follow-Up Program designed to develop a relationship with your customer by sending to them a gift tin of made-from-scratch chocolate chip cookies as a way of saying "Thank You". Our program revolves around a designer canister of made-from-scratch chocolate chip cookies which are baked fresh the day they are sent to your customers. Your carefully prepared gift package will include the delicious cookies and two custom designed gift cards. The first card is personalized with your company logo and an individual message. The second card is postage paid customer survey card specifically to include the information you want to know from your customer. Our goal is to place you in the most favorable position to receive repeat and referral business. We do all the work on your behalf and you get all the credit! Cookie Advantage is a great tasting way to say "THANK YOU!" Cookie Advantage - Giving you an advantage over the competition with fresh-baked chocolate chip cookies!